The villains of Looney Tunes land had it rough. Imagine going out for a relaxing day hunting, only to meet up with a Brooklyn-tough rabbit whose sole purpose in life is to make yours miserable. Picture yourself looking for your next meal in the Mojave Desert and failing to ever find one, with only a mocking “beep beep” to keep you company as you fall off of cliff after cliff after cliff. But no one had it rougher than poor Sylvester, who even in his own home couldn’t catch a break. He was walloped hard enough with a frying pan to leave a contour of his face in it, tricked into eating his own tail as part of sandwich, and smacked relentlessly by a broom wielding granny -- all in the pursuit of an enemy who isn’t even big enough to qualify as an hors d'oeuvre. When we were kids we identified with the Looney Tunes villains’ prey because they were cuter and smaller, just like us back then. But as we grow older and see life’s opportunities slip through our fingers again and again, we feel like every setback pounds us into the ground like a railroad stake by Butch the Bulldog. So what do we do? We keep trying, thumb our noses to fate, and come up with even more devious and complicated plans to get what we want, be it a pesky little bird or our all of our wildest dreams. Characters like Sylvester represent us, the indefatigable, undefeatable heros we aspire to be. Even if they talk a little funny. 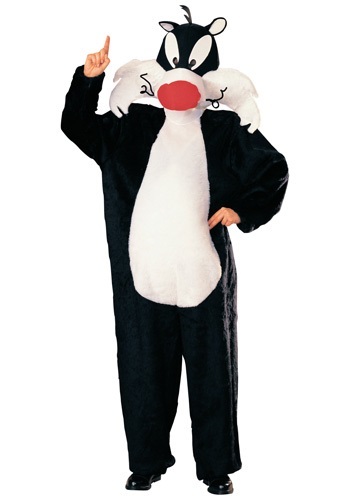 Our Adult Sylvester Costume lets you pay tribute to our favorite feline antihero. Made from plush polyester, this Sylvester costume is so pleasing to the touch people won’t be able to resist getting close to you. The fully detailed headpiece perfectly captures Sylvester’s goofy grin, and this costume will leave your hands free to party down or just open bird cages. See our adult Tweety costume for the perfect pairing to this ensemble, but do play nice with whomever you get to wear it!